Horses and courses, of the collegiate variety, coalesced at the Big Red Spring as Saratoga held its first-ever College Day. Karaoke began the proceedings prior to the first post at 2:30 pm. The karaoke was followed by Team Trivia and a 7 pm backyard concert. After the running of each race, the name of a lucky person was drawn for $1000 in scholarship money. Students of higher mathematics, meanwhile, focused on winning the Pick Six. The carryover began at $656,422. In the race before the Pick Six began, two-year-old horses ran 1 1/16 miles on the Mellon turf course in the grade III With Anticipation Stakes, an obvious prep for one of those new Breeders’ Cup races that a lot of people think are unnecessary. The winner Interactif got a break when Strike the Tiger, previously victorious at Royal Ascot, scratched. On the other hand, it could have been the other way around. Jockey Kent Desormeaux said the Todd Pletcher trainee could be any sort of horse. The son of Broken Vow ran his race on a firm lawn in 1:41.41, reminding some of Big Brown on a September afternoon several years ago. Horses easy to bet won the races that followed. Bettors who picked six winners correctly were paid $88,747. Three “Ginsburgs” – a term turf writer William Boniface of the Baltimore Sun coined for horses with alliterative names - triumphed in succession. Lovely Lil won the fourth by a mile. Classic Campaign took the fifth by a nostril. Gitchee Goomie beat stablemate In Te Domine to inch Linda Rice closer to Todd Pletcher in the trainer standings. Then Leamington prevailed in the Voodoo Dancer Stakes. It was a pretty nice roster of fillies and mares that she beat. Allan Garcia rode four winners to none for Ramon Dominguez. Only three victories stand in his way now from being the class valedictorian. Dominguez finished second five times and third once, although that wasn’t good enough to put distance between him and the challenger. There were no signs on campus that only three days of racing remained. Final grades for the summer semester aren’t official, but everyone knows what they’ll be. 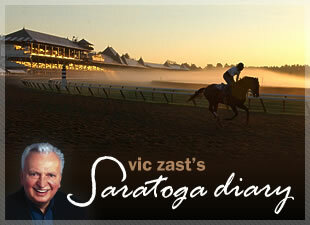 Saratoga will earn an “A” in attendance, deportment and effort. Gates open Saturday at 7:00 am so folks can find a spot to camp out on Rachel Alexandra’s day. The forecast is for uninterrupted sun. John Walsh, the celebrated TV crime fighter, led his Vero Beach-based Shamrock Ranch polo team into competition at the C.V. Whitney field on the northwest side of town. The powerhouse Saratoga Springs H.S. Blue Streaks football squad took on LaSalle, its conqueror in last year’s Class II championship semi-final game. Fall is on the calendar, but summer lingers in the air like the aroma of corn on the cob roasting.